Re: SUPERHERO "WHO AM I"
I'm pretty sure I know the answer to yours, but I'll wait a couple days to see if someone else gets it. I'll add a hint on Sunday or so if no one does. HINT: My colleagues are Black Rapier, Quarrel, and Cleopatra. I was born at the start of the 20th century. Like several others who were born at the same time, I have a very long lifespan (over 100 now) as well as super powers. I once froze Dracula then kicked him in the crotch. One of the people I work with is a drummer. Sorry the answer was Elijah Snow from Planetary. Someone else should do the next one. What was the name of this Timely Comics beauty? Piece of cake... Sun Girl. Nope, its a Vertigo imprint if that helps. 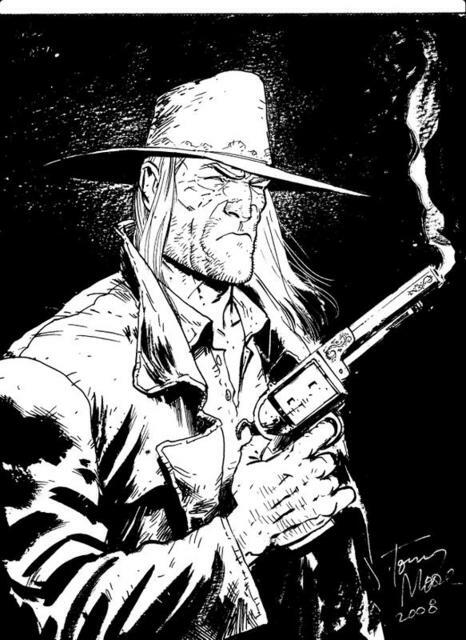 Shares a Title with a Texan and an Irish"man"
The Saint of Killers! Gunslinger who ends up shooting God. Good Job Dean... Got a quiz for us? I once spent a happy day squatting in the Tattered Cover Bookstore in Denver (go, go now!) reading the whole Preacher series.